This flower is my baby! It’s Sleepy Hollow time again! 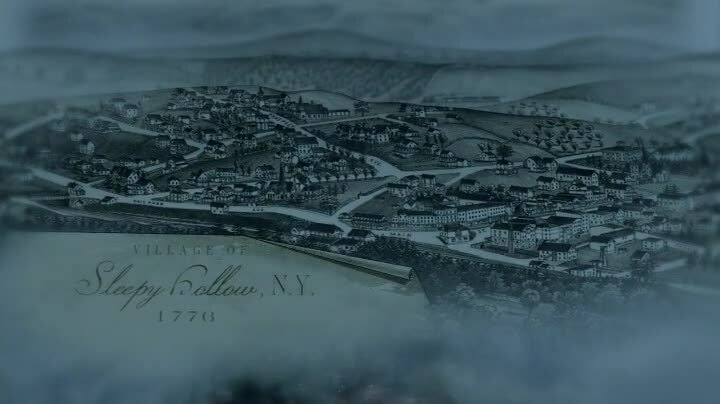 After last week topped everything so far, this week’s Sleepy Hollow pulls back while switching gears to do a mysterious disease episode. There is also exploration of more colonial American myths (at this rate they’re going to run out of actual historical stuff to revise by season 2!) and let’s use know that the other three Horsemen of the Apocalypse aren’t just sitting around eating pizza. Okay, maybe Famine. That guy’s a jerk! There are some mysteries hinted at that should pay off later, and Captain Irving and Detective Morales both have moments beyond scenes to remind people they exist. 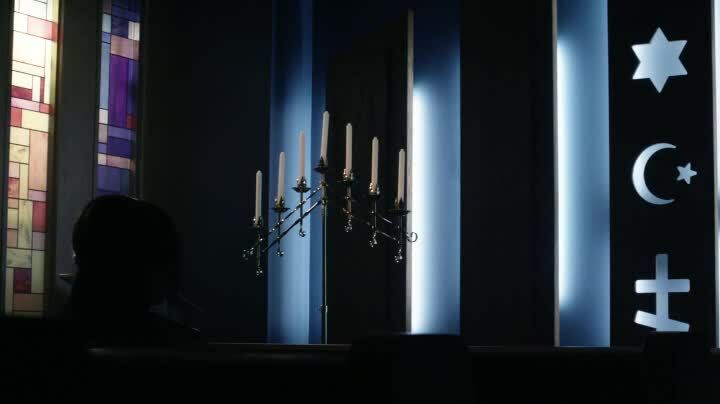 Even Ichabod’s wife shows up again, having barely appeared in the last two episodes (and she even comments on that fact!) The main problem with “John Doe” is it is following a stronger episode, so I’m just being more picky. Will Morales’ partner turn out to be evil? He seems way to nice to not be secretly evil. Also has anyone seen John Cho? Or smelled John Cho? Because he should be pretty rank by now and easy to track down. I’m sure he’ll appear again before too long. Nobody told me I would be in this episode! A mystery kid in old timey clothes peeps on a mystery girl in the woods. 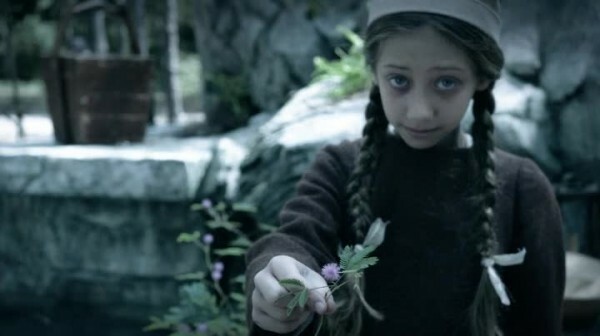 The girl is collecting flowers and wants to play with the boy once she sees him, running off and daring him to catch her. He does so, but soon she vanishes and is replaced by an armored dude on horseback. The design is familiar because we’ve seen him before, during the shot of all four Horsemen of the Apocalypse in Blood Moon. Though we don’t find out right away, this guy is Pestilence and he’s not very nice. Pestilence chases the kid to the highway, at which point the horseman and his horse vanish into dust. Mystery Kid is confused by the highway and cars, and his old timey dress indicates that he might be a time traveler like Ichabod. Food in the future is weird! Speaking of Ichabod, he’s moving into Sheriff Corbin’s cabin, Abbie helping him get settled. We get several confused about the future jokes in rapid succession: Ichabod doesn’t know what “spackle” means, Ichabod sniffs a loofah in utter confusion, Ichabod gets frustrated at anti-theft plastic. We’ve all been at that last one, Ichabod! There is a call about a wandering kid on the police scanner, and as that’s near the cabin Abbie heads over to help, Ichabod tagging along because now everything that happens is probably going to be something weirdo, so why not be prepared? Mystery Kid is unconscious, and has blackening veins! Mystery Kid wakes up just enough to say a random nonsense word. Except Ichabod understands what he said, because he’s speaking Middle English – the English spoken in the Middle Ages! Ichabod of course knows the language and says something back. Ichabod tells everyone that Mystery Kid says “evil girl”. 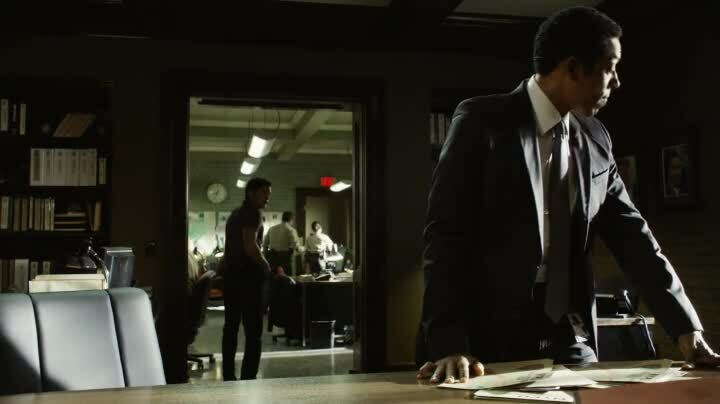 Detective Luke Morales questions Captain Irving about Crane and what the crap Crane is doing working with the cops and, most particularly, Abbie. Captain Irving defends Crane and orders Morales to stop being weird because he used to date Abbie. In a firm manner. I like Irving because he obviously knows weirdo stuff is going on, and that Crane and Mills manages to save the day again and again, so he backs them up even though it seems crazy. 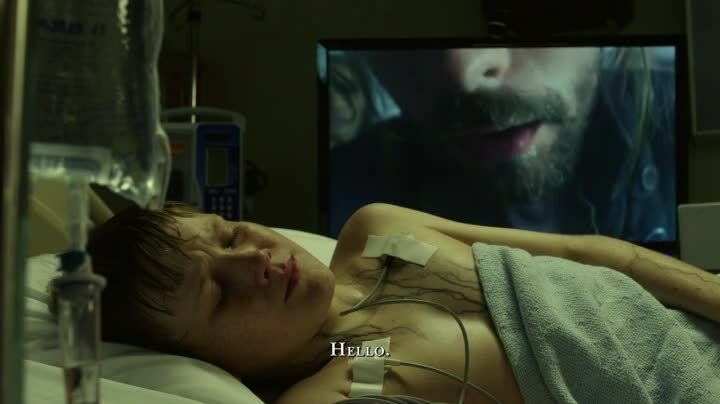 Ichabod talks via video remote to Mystery Kid, who is walled off in a plastic quarantine by the CDC. He’s Thomas Grey, and he’s from Roanoke. The famous lost colony. 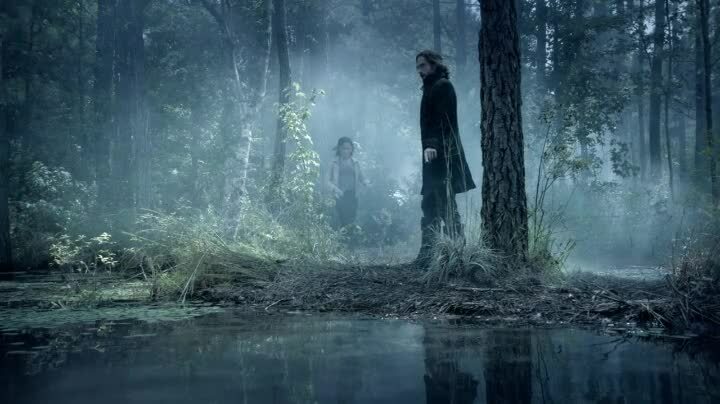 Abbie plays the cabbagehead for this scene to ask “What is Roanoke?” so Ichabod can explain it by a story-telling flashback for all the viewers at home who did bad in history class. Important plot information: The black vein disease is spreading to more people. The EMT who was on scene dies, having visions of Pestilence on his horse while dying. Blurry Guy is coming for you! Ah, I love washing my neck hole! 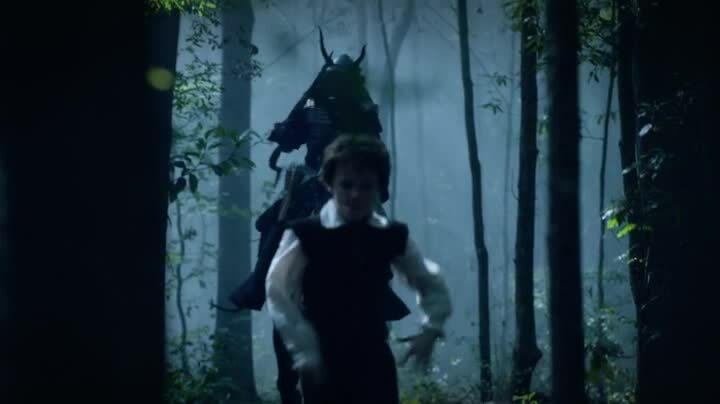 Abbie and Ichabod try to track where the kid came from, wandering into the woods. Their banter includes Abbie asking Ichabod “Who is more sarcastic – Jefferson or Adams?” Ichabod’s answer is steeped in sarcasm itself. The trail goes to a lake that is deeper thank Ichabod’s prodding stick. 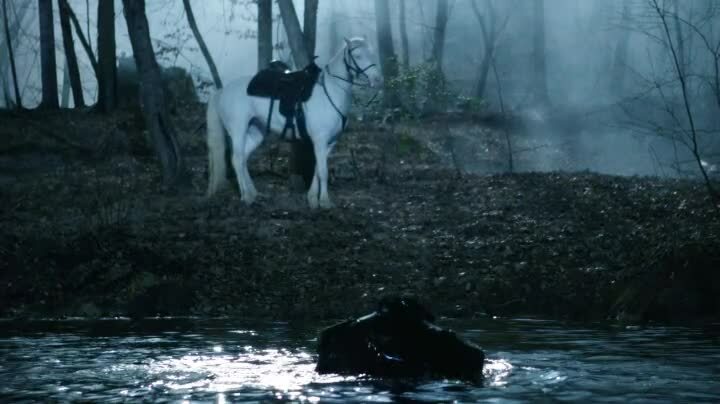 But thanks to tracking skills learned from his fox-hunting dad (something Ichabod reveals he did not care for) Ichabod locates a secret bridge across the lake. They make it to an island where there is a trapped in time village. Where everyone is infected with the black veins disease. The town elder reveals Pestilence infected their town and a dead baby angel Virginia Day led them to this secret place where the disease won’t kill them. 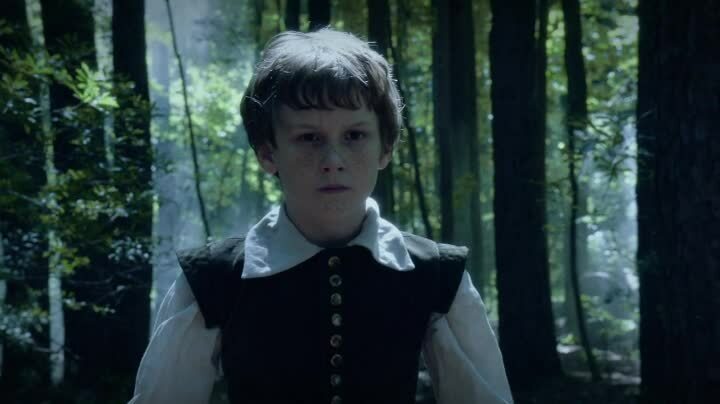 The only way to save Thomas and the others who are infected is to bring Thomas back to the village. The elder says all this in Middle English, which is subtitled, but is close enough to English I understand like 80% of what he says. Which makes it sort of weird. if the plague spreads too much, Pestilence will become powerful enough to return and team up with the Headless Horseman. This has to be stopped, because that would just be too much horse poo in the roads for Sleepy Hollow to handle, dooming the town. Also a weird girl offers Abbie a flower, which I thought was a clue, but turned out to be nothing except Abbie refusing a flower from a weird girl. You know what they say, communism was just a red herring. Back at the hospital, there is no time to figure out a way to get Thomas out because Ichabod is infected and is quarantined and sedated by the CDC. While under, he has a vision of Katrina. 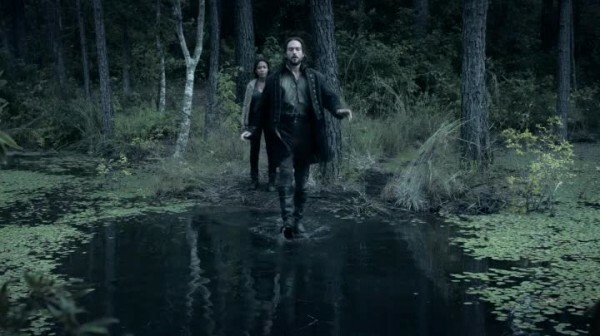 Katrina reveals she is trapped in Purgatory, and that Ichabod can see her because he’s either dead or close to death. Also she’s a captive of Molloch, yes our friendly Blurry Demon From Legend is here and makes a few second cameo harassing Ichabod before he wakes up. 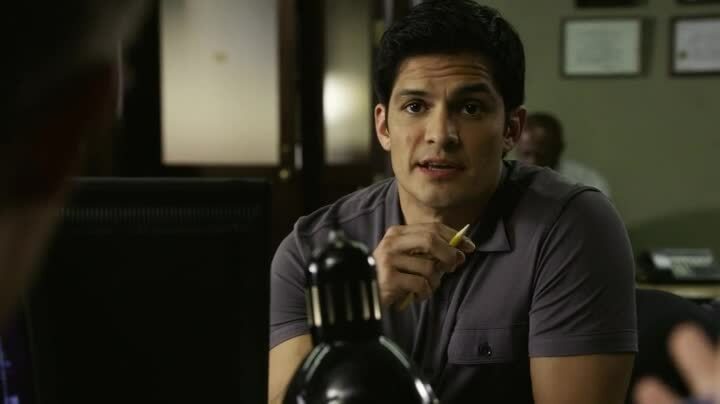 Morales had ignored his bosses orders to not worry about Ichabod (even Morales’s partner says not to worry about it!) and was checking up. 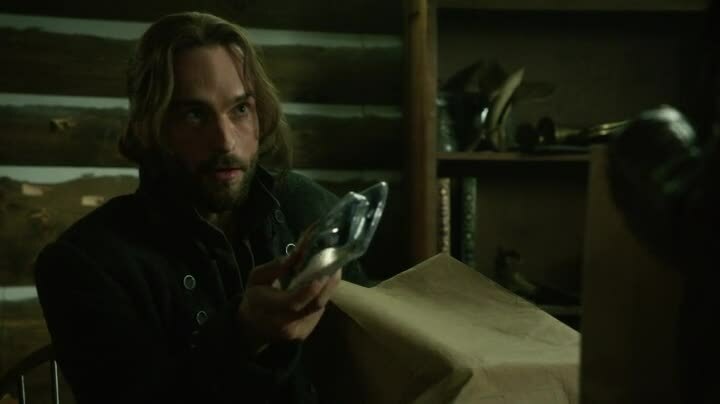 Morales gets a return call from Oxford confirming Ichabod Crane is a professor there and on loan to the Sleepy Hollow police. Hmmm… Just who set up that cover so intricately? Hi, I’m Tom Sawyer, now in Sleepy Hollow for no good reason! Captain Irving is trying to contain a panic in the town and control traffic and won’t help Abbie, so Abbie prays. Abbie realizes it is the water used in baptism that is saving the Roanoke people. Also a woman is in the church and we don’t see her face. Clue? Or not wanting to pay an extra more money? You be the judge! Abbie somehow convinces Captain Irving to help get Crane and Kid loaded onto ambulance for “transfer” so Abbie can steal them and return them to the town. Why Irving is suddenly free enough to listen to her and also listen to her when he told her no just a few scenes ago I am not sure. But you got to have faith. You got to have faith-a-faith-a-faith! Abbie manages to drag the complaining and tired Ichabod (and the asleep Thomas) back to the fountain and gets them dunked just in time for Pestilence to attack, but also jut in time for Pestilence to disappear into dust when he attacks Abbie. Then everyone in Roanoke disappears! Wait, what? They were already dead and Thomas came to life when he was lured out of the woods, but all this was stopped by Abbie’s faith. Headless Horseman! Good ol’ Headless is coming out of a river (Does he sleep in the river?) 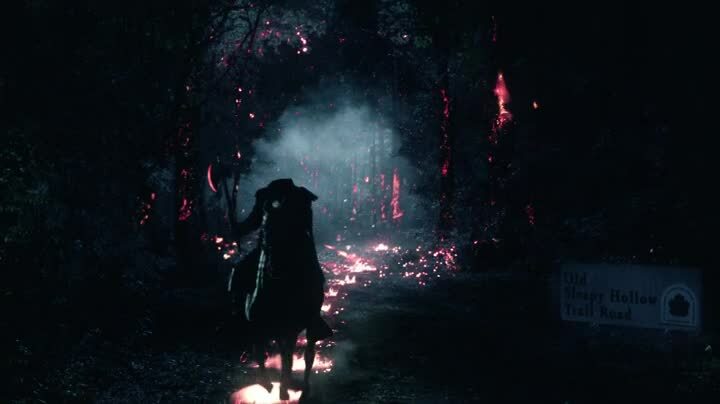 and riding his white horse with glowy red eyes as flames are all around as the Adobe after effects works overtime! Look out, Sleepy Hollow! Those video effects look dangerous…. Ichabod Crane will never be a successful pickpocket now! You don’t like 7-Up? Get out! My character’s arc is “slightly annoying ex-boyfriend”! Let the Monty Python Holy Grail jokes begin! The prop department only had the Jewish stuff, so we had a grip spraypaint all the other religious symbols on the wall. The Headless Horseman is trapped in a terrible action movie poster!